Transcription: Think it over. 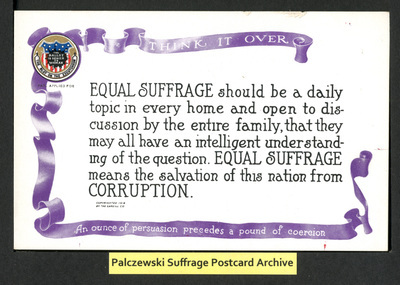 EQUAL SUFFRAGE should be a daily topic in every home and open to discussion by the entire family, that they may all have an intelligent understanding of the question. EQUAL SUFFRAGE means the salvation of this nation from CORRUPTION. An ounce of persuasion precedes a pound of coercion.